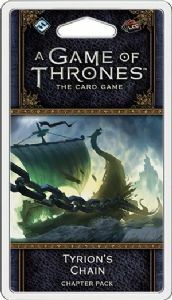 With the Tyrion's Chain Chapter Pack for A Game of Thrones: The Card Game, the War of Five Kings cycle approaches its dramatic conclusion. Here, you'll find plenty of new support for Summer and Winter decks, inviting you to draw your strength from the warm zephyrs of summertime or the howling gales of winter. As the final chapters of A Clash of Kings play out in the card game, you'll also find iconic characters entering the game for the first time, including Qhorin Halfhand, Salladhor Saan, Podrick Payne, and Ser Arys Oakheart. It's time for you to rally behind your King and enter one of the greatest battles in the game of thrones!